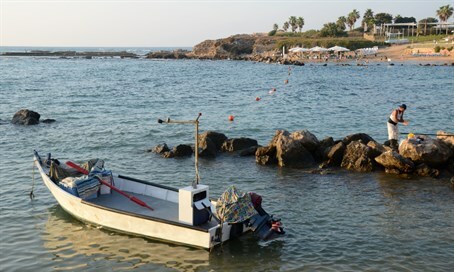 A ten meters long baby whale was seen swimming off the coast of Caesarea. In a rare event, what is believed to be a fin whale was spotted Sunday afternoon just 20 meters (65 feet) off the coast of Caesarea and Ma'agan Michael. Dr. Aviad Scheinin, chairman of the Israel Marine Mammal Research and Assistance Center (IMMRAC), told Channel 2 News that the whale is estimated to be a few months old and that the calf was separated from his mother for unknown reasons. He explained that at this age, calves are usually attached to their mothers and he must have swum close to shore due to distress. Unfortunately, due to his size of about 10 meters (32 feet) in length, the chances of his survival are not high. Dr. Scheinin added that the center does not intend to capture the baby whale, but will continue to follow him and see what fate brings. “This type of whale is supposed to be at a depth of hundreds of meters… We hope that he will return to the open sea,” said Dr. Scheinin. An adult whale of this kind may grow up to 25 meters (82 feet) – the second largest whale in the world, after the blue whale – and way approximately 70 tons. This is not the first time a whale has been seen off the coasts of Israel. The IMMRAC has documented several cases of the aquatic mammals swimming off the shores of Tel Aviv, Ashdod and Ashkelon. The most notable case was in 2010, when for the first time in Israel, a gray whale the length of about 12-15 meters (39-49 feet) was spotted near the coast of Herzliya.